Suncheon-si, Tuesday 10 September, 12:30pm We head back to the hotel for a quick shower and change of clothes, before lunch at a nearby eatery – a deliciously delicate clam noodle soup. The soup is brought in a large bowl full of a light broth. At the bottom of the bowl is a mound of noodles, and suspended in the broth is the flesh of tiny clams, which has been carefully extracted from the shells. With the bowl is brought an empty plate, in addition to the one we already had to tuck into the side dishes. There are many ways to eat a noodle soup, it seems, each one as acceptable as the other. You can ignore the empty side plate and attack the soup with spoon and chopsticks; you can fish all the noodles out of your soup and put them on the side plate, maybe adding some kimchi or other side dish to the pile – thus separating out the solids from the liquid; or you can do a combination of the two, which is what I settled on. The ajumma behind the counter looked on in satisfaction as her two guests tucked in with relish. The plate of nicely spiced omelette rolls had to be refilled more than once, and the kimchi also needed to be topped up. A chilled beer helped wash away the heat of the morning and soon disappeared. We emerge from the restaurant with bellies full. After the disappointing coffee at breakfast I was hoping to find a decent coffee shop in the neighbourhood. We had passed many such thriving establishments on the way to the expo that morning, but now strangely they all seemed to be closed. Instead, Kyung-sook spots a hair salon and decides she needs a haircut, while I sit patiently browsing the women’s magazines and dozing. We’re soon on the road to Unjusa, which the sat nav tells us will take around 90 minutes. We are in plenty of time, and we debate whether we should after all make a detour via Naganeupseong fortress and folk village, which is in fact not far from our route. Or the green tea slopes of Boseong is just to the south of the main road, close to where we need to turn off. But by now our mind is set on Unjusa and Hwasun County. Instead, we stop off at a service station to grab a coffee, only to find that the decent coffee shop was closed. The tasteless liquid from the vending machine did little to wake us up. But as this was the closest I was going to get to Boseong I bought some local green tea. I should have realised that at 10,000 Won per packet I wasn’t going to get anything particularly special. Sure enough, when I get the tea home I discover that it tastes like mud. As we get nearer to our destination, we see signs to a dolmen park and again wonder whether we ought to make a detour. But our sense of curiosity is not strong enough to delay us. What possible interest could a few stones have? Of course, with hindsight, I now realise that I missed out on seeing some UNESCO-listed heritage. 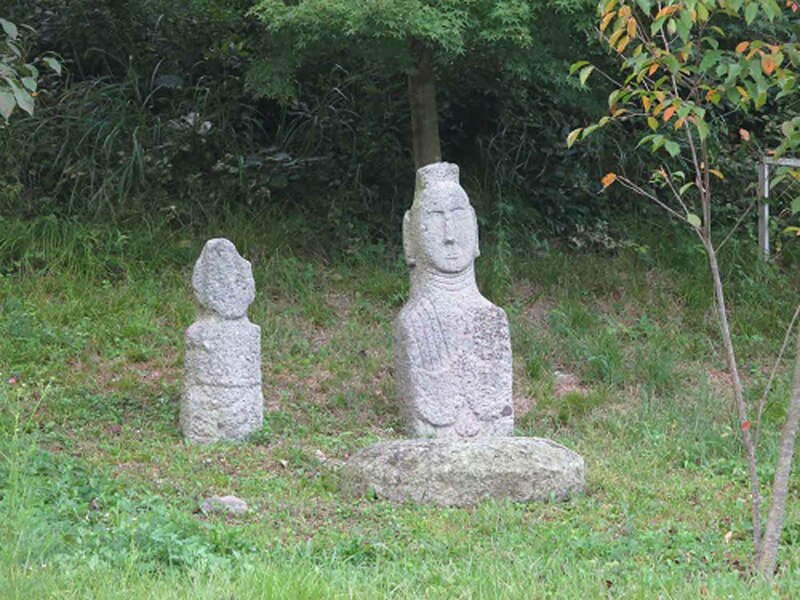 The Dolmen sites in Hwasun-gun (Jeollanam-do), Gochang-gun (Jeollabuk-do) and Ganghwa-gun (Incheon) were listed in 2000. The GPS takes us straight to the temple, and a quick phone call to the administration office ensures that the entrance barrier is raised so that we can drive all the way up from the main car park up to the temple itself. Immediately past the barrier is a traditional gate through which the road passes; but there is also a rough track which goes around the outside of the gate. We take the detour, assuming that only VIPs or formal religious processions are allowed under the arch of the gate itself. The reason for visiting Unjusa is an exhibition I saw in London earlier in the year near the British Museum. Wisdom and Compassion, an exhibition of Buddhist-inspired art, had included some striking photographs of stone Buddhas by Jeon Jewoo. Jeon has long specialised in Buddhist themes and now runs the Korea Institute of Buddhist Photography while still making time for his art. The exhibition’s curator, May Kim of Mokspace Gallery, had noticed how long I had been lingering in front of Jeon’s work and told me that all the photographs had been taken at a temple in Jeollanam-do. She explained the attractions of the temple and offered to fix me a visit, given that she knows the senior monk there. This was an offer not to be turned down, and so four months after the exhibition’s opening reception I found myself at the temple’s entrance with Kyung-sook. The temple is something of a mecca for photographers, and judging by the huge car park at the entrance gets pretty busy during religious holidays. The long driveway from the main visitors’ car park up to the temple itself immediately made clear that this temple is a special place. Across a field to the left, a row of contemporary Buddha figures stare out at you. Ahead of you, all the way up the valley to the temple, are pagodas of different shapes and sizes, and everywhere else you look there are ancient stone Buddha statues dating back to the Koryo dynasty. The approach to the temple is different from the classic mountain temple. In the archetypical approach, the path winds gently through a forest, hugging the contours of the landscape and offering glimpses of the main gate of the temple or its closest buildings, but never a complete view. With Unjusa, you have a clear view of the temple all the way up the broad flat valley. Your eye is drawn to it, but on the way your attention is distracted by Buddha sculptures lying around or resting against a rock as if the whole valley is an open-air artist’s studio, and the sculptor has just popped out for a cigarette. The senior monk, Jung Hyun Sunim, together with the abbot, was away at a conference in China at the time, so we were greeted by the remaining monk, Wonsan Sunim. As always happens, welcome involves tea. We sit in front of the squat but graceful solid wooden tea table, Kyung-sook and Wonsan Sunim chatting. I savour the tea: we are told that it is this year’s crop from a small temple nearby, picked in the first week of the harvest by the female monks. It is truly a special tea, and I feel rather inadequate as I hand over my gift of Twinings Earl Grey. I’m never quite sure of the etiquette of tea drinking. I’m very fond of the best green tea, and I like to savour it. The more I drink it, the more my host makes. I then feel obliged to drink it, and then my host feels obliged to make more. It’s a very English cycle of embarrassment and obligation, I’m not sure at what point you are supposed to decline the next cup. But Kyung-sook is a great conversationalist and Wonsan Sunim seems happy to talk and to continue making tea, as our bladders gradually fill up. It’s muggy in the valley, and the mosquitoes are happy to find some new flesh to feast on. Kyung-sook tries to kill one by clapping her hands. I had thought that in a Buddhist temple all life was sacrosanct, but Wonsan Sunim didn’t seem to mind. The conversation turns to Korean Buddhism. 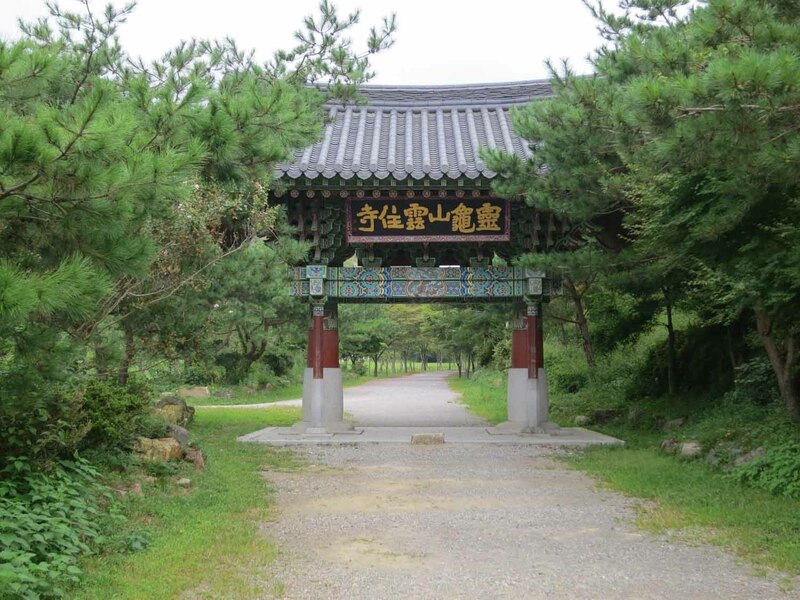 Wonsan tells us that when we were in Suncheon we should have gone to visit Songgwangsa (송광사, Spreading Pines Temple), a monastery known as one of the “Three Jewels” of Korean Buddhism, along with Tongdosa and Haeinsa. The latter two temples are said to represent the Buddha and the dharma respectively, while Songgwangsa represents the sangha or monastic community – and the temple is known for producing many senior monks. Although I’m cursing myself for not having researched enough in advance, it’s always good to have an excuse to go back to a place. This is my first time in Jeollanam-do, and a day and a bit is not nearly enough to cover a province. We are chatting for an hour, and then have less than an hour to stroll round some of the temple precincts and surrounding hills before the 6pm communal dinner in the kitchens, and then 7pm evening prayer. We are expected to attend both evening prayer and the 4am service the following morning. We climb the stairway to the top of the hill to the West of the temple to see a pair of huge Buddha statues carved side-by-side into the horizontal rock at the summit. The larger figure is around over 12 metres long, and looks more pagan than Buddhist. It is set at rather an uncomfortable-looking angle, with the head slightly lower than the feet. But the site has a strange aura to it, silent and mysterious. On the way up, several other free-standing stone Buddhas nestle under a giant boulder, and stone pagodas seem to rise wherever you look. Back in the kitchens, we share supper with some of the labourers who are involved in various construction projects at the temple or in toiling in the fields: the two of us appear to be the only temporary visitors. The meal is a simple one: rice with vegetable side dishes, slightly more spicy and earthy then the somewhat delicate flavours we had enjoyed in Beopgyesa. We take possession of our rooms and then head to the shrine for evening prayer. We lift a cushion from the piles on the side of the room and sit on them, cross-legged on the floor, waiting for the others to appear. The mosquitoes start swarming round to enjoy their feast, and it’s rather difficult to focus on higher things when you’re wondering which bit of you they are biting at that moment, and whether it’s acceptable behaviour to swat them. You begin itching in all sorts of places, even though you cannot see your tormentor and are unable to tell whether you have been bitten or not. You surreptitiously scratch your face, your ear, the sole of your foot, partly to relieve the itching, and partly in the hope of scaring away any insects that really are biting you. I finally catch sight of a real rather than imagined pest, catching it on the floor in front of me with a thud of my hand. Fresh red blood is smeared on the floorboard and my palm. Probably mine. It is a temporary victory, as the ceremony is about to start and it is unseemly to be distracted by the insects. We don’t mind the semi-enforced devotions. Without our presence, Wonsan Sunim would be saying evensong on his own. No other monks or visitors are there. The repetitive chant is comforting and peaceful, and the twenty minute service passes very quickly, despite the mosquitoes. And strangely, as soon as the service is over the mosquitoes are gone, never to bother us again during our stay. It is pitch black by now, despite the hour being as early as 7:30. And by 9pm all lights are to be out: we have to be up at 4am for matins. I stand guard while Kyung-sook showers in the ladies’ washroom, and then have my own – the third of the day. In one corner of the men’s communal washroom a big washing machine is churning away, and against the wall opposite the door there are two or three hand-held showers. In the centre of the room is a drain to take all the waste water, and a hook behind the door is there to stop your clothes getting wet. As I often find with Korean bathing arrangements, it’s nigh-on impossible to get yourself dry, and as I walk back to my room I wonder whether the residual stickiness will eventually disappear or morph into perspiration. I retire to my room to do an hour’s worth of editing of the publicity materials for the Sancheong Oriental Medicine Research institute. After half an hour there is a knocking on the door, and Kyung-sook hands me a plate of black grapes, a gift from the temple kitchen. She then retires, leaving me to struggle with Enterpriser Cooperatives. The fruit is beautifully sweet and juicy, much more tempting than battling with dry prose. I turn out the lights, thankful that the doors and windows of the room are well-fitted with mosquito mesh. 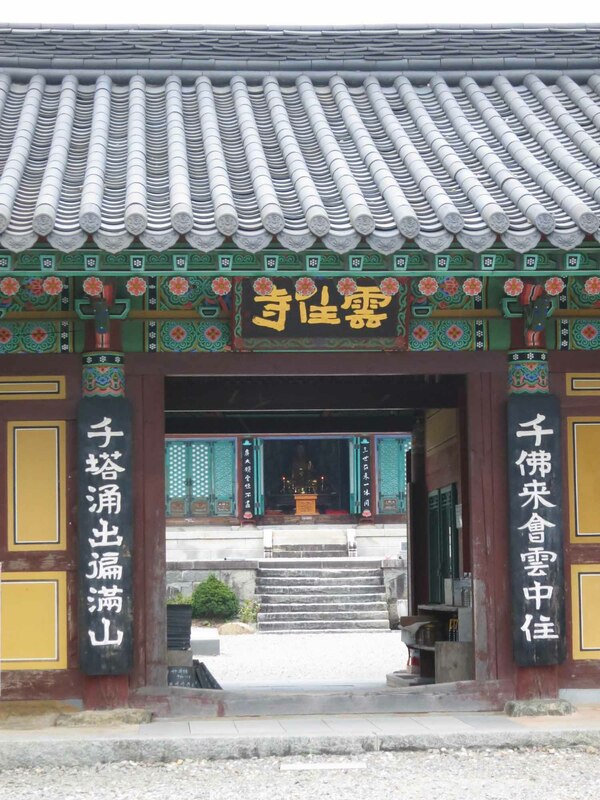 Interestingly I stayed in Suncheon but never even heard of Unjusa but if you ever do get a chance to go back the temple to temple hike from Songgwangsa to Seonamsa Temple is great, including a great food place half way…. oh and also surprisingly I drank some awful tea whilst there! 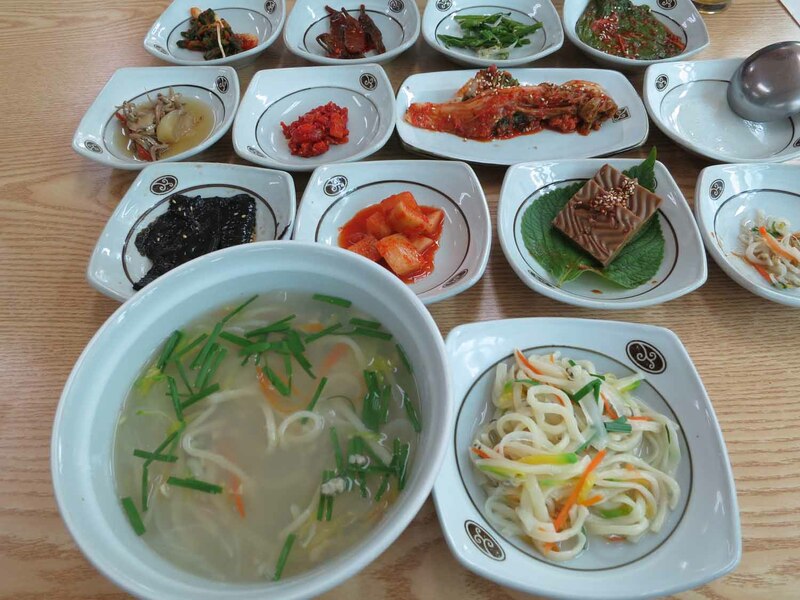 Unjusa is a bit of a drive from Suncheon – maybe as much as two hours. Songgwangsa and Seonamsa are definitely on my list of places to visit next time I’m in the area. Thanks for the tip about the hike.